NEL, the flow measurement specialist, has completed a major upgrade of its densitometer calibration facility – the only independent calibration facility of this type in the UK. The newly upgraded test facility will significantly reduce instrument testing turnaround times by 30%. The facility’s enhanced capabilities allow greater flexibility for helping companies that require emergency assistance with calibration and testing. The densitometer calibration facility has been designed to more accurately simulate real installation conditions, calibrating densitometers at their anticipated production and processing conditions. This will deliver significant benefits for the oil industry, as inaccurate measurements can leave operators vulnerable to legal disputes and financial exposure. The facility’s extended operating pressure range now runs from 1 to 151 bar, while the operating temperature range runs from 5°C to 100°C. The facility can also maintain temperature consistency at better than +/-0.005°C. Norman Glen, Principal Consultant at NEL, said: “Densitometers are the cash registers of the oil industry, so our investment is vitally important to both operators and industry regulators, which want to be assured of accurate financial reporting, fair trade and taxation. “The upgrade will allow us to complete complex tests more efficiently, reducing both lead times and test durations, enabling us to be more responsive to short notice test and certification requests. Our new upgrade will allow us to offer this essential service to a wider range of operators, and we will continue to invest in the facility to extend its operating range and increase its throughput whilst ensuring the highest accuracy,” concluded Glen. The densitometer calibration facility upgrade forms part of NEL’s strategic development programme to make it the facility of choice for both vendors and operators. 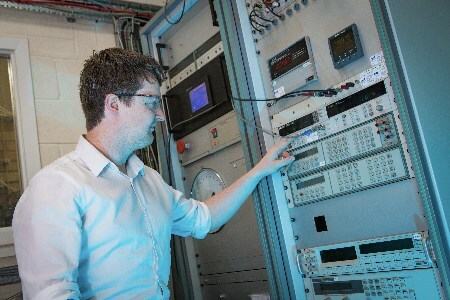 NEL’s Flow Measurement Facilities in Glasgow are the primary flow measurement standard for the UK, under the UK’s National Measurement System (NMS). The NMS is the UK's national infrastructure of measurement laboratories, which delivers world-class measurement science and technology. It provides traceable and accurate standards of measurement for use in industry, academia and government.